In the reign of Robert I. John Grant had acquired possession of the lands of Inverallan, in Strathspey, the first territory which the Grants obtained in this region and gradually by grants from the Crown, by purchase, and in other ways, they acquired possession of the greater part of the lands in Strathspey—from Laggan, to a considerable distance beyond lower Craigellachie, which stands near the confluence of the Fiddich with the Spey. Upper Craigellachie marks the boundary between Badenoch and Strathspey, and the craggy rockwas the meeting-place for the Clan Grant in times of war. The war-cry of the clan was: "Stand fast, Craigellachie". Many will recognise this war-cry from Grant's use of it on their blended whisky. Craigellachie, a village in the N of Aberlour parish, W Banffshire, finely seated, 300 feet above sea-level, on the left bank of the Spey, which here receives the Fiddich, and here is crossed by a handsome iron bridge, with round embattled towers at the angles and a single arch of 100 feet span, erected in 1815 at a cost of £8000, as also by the viaduct (1857) of the Great North of Scotland railway. The junction of the Morayshire, Keith, and Strathspey sections of that system, it is 12f miles SSE of Elgin, 14¾ WSW of Keith, 68 NW by W of Aberdeen, 33¼ NE of Boat of Garten, and 121¾ N by E of Perth; and has a post office, with money order, savings' bank, and telegraph departments, two insurance agencies, gas-works, an hotel, an Established church, with 116 sittings, and a girls' school, with accommodation for 81 children. Water has been introduced, and building actively carried on since the summer of 1880, when a new street was sanctioned round the top of the lofty quartz crag above the station, on feus given off by Lord Fife at £8 per acre. 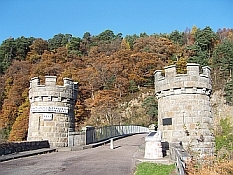 The Craigellachie Bridge is a cast iron arch bridge spanning the River Spey. It was designed by the renowned civil engineer Thomas Telford and built from 1812–1814. The bridge has a single span of approximately 46 metres (151 ft) and was revolutionary for its time, in that it used an extremely slender arch which was not possible using traditional masonry construction. The ironwork was cast at the Plas Kynaston iron foundry at Cefn Mawr, near Ruabon in Denbighshire by William Hazledine, who cast a number of Telford bridges. 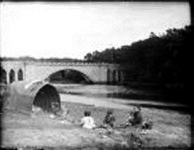 The ironwork was transported from the foundry through the Ellesmere Canal and Pontcysyllte Aqueduct then by sea to Speymouth, where it was loaded onto wagons and taken to the site. Testing in the 1960s revealed that the cast-iron had an unusually high tensile strength. 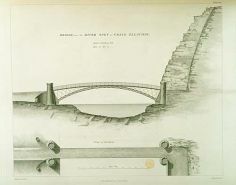 This was likely specified by Telford because, unlike in traditional masonry arch bridges, some sections of the arch are not in compression under loading. At each end of the structure there are two 15 m (49 ft) high masonry mock-medieval towers, featuring arrow slits and miniature crenellated battlements. The bridge was in regular use until 1963, when it was closed for a major refurbishment. The side railings and spandrel members were replaced with new ironwork fabricated to match the originals. A 14 ton restriction was placed on the bridge at this point. This, along with the fact that the road to the north of the bridge takes a sharp right-angled turn to avoid a rock face, made it unsuitable for modern vehicles. Despite this it carried foot and vehicle traffic across the River Spey until 1972, when its function was replaced by a reinforced concrete bridge built by Sir William Arrol & Co. which opened in 1970 and carries the A941 road today. Telford's bridge remains in good condition, and is still open to pedestrians and cyclists. The bridge has been given Category A listed status by Historic Scotland and has been designated a civil engineering landmark by the Institution of Civil Engineers. It was used as the site of a parade upon the amalgamation of The Gordon Highlanders and The Queen's Own Highlanders (Seaforth and Camerons) to form The Highlanders (Seaforth, Gordons and Camerons) in 1994 after exactly 200 years of service. A plaque has been fitted to the bridge parapet to commemorate this. (Click the image on the right to view the full photo set on Flickr). In 1866 the GNSR took over the track and without consultation with the Morayshire, closed the Rothes to Orton line to passenger traffic—much to the Morayshire's annoyance. 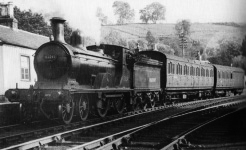 By a series of small Speyside railways, nominally independent but controlled by the GNSR, it joined track with the Morayshire Railway at Craigellachie and finally got its independent route to Elgin. On 30 July 1866, the GNSR was granted consent to consolidate its series of small Speyside companies and to take the Morayshire Railway under its full ownership when terms and the debt issues had been resolved. The GNSR agreed to take over the running of the network as soon as the Morayshire constructed a viaduct across the Spey connecting with the GNSR's Dufftown line. The direct link between Elgin and Rothes opened to passengers on 1 January 1862 (freight traffic had opened a day earlier) while the bridge over the River Spey was completed on 1 June 1863 joining the GNSR controlled track at Craigellachie on 1 July. The original station was now renamed Dandaleith and the new one assumed the Craigellachie name. At a meeting of the Society of Engineers, in January, 1866, a paper was read by MIr. W. H. Mills, on the Cralgellachie Viaduct. This viaduct vvas constructed for the purpose of carrying the Morayshire Railway over the River Spey, at Craigellachie, Banffshire, the engineers being Mr. Samuel (M. Inst. C. E.) and the author. It consisted of three spans of 57 feet each on the north bank, and one span of 200 feet over the main channel of the river; ordinary boiler-plate girders constituting the former, and the latter being of wrought-iron on the lattice principle. The piers and abutments were of solid ashlar masonry, and the works were arranged for a single line of railway. It appeared that the excavation for the foundations was commenced in May, 1862, and that the viaduct was opened for public traffic in July, 1863. The total cost had amounted to £12,199 or equal to £29 10s. per lineal foot. — Annual of Scientific Discovery,for year 1866 and 1867. The railway served the numerous distilleries that operated in the Spey Valley, many of these distilleries having their own small tank engines, or ‘pugs’ as they were known. In 1923, the railway became part of the London & North Eastern Railway (LNER) and through passenger services were advertised from Boat of Garten to the South via Aberdeen. The line became part of British Railways in 1948 and many cost-saving measures were considered, including the introduction of diesel rail buses in the late 1950s. 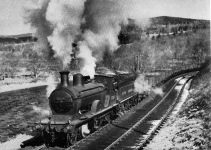 The Strathspey line closed to passengers on 11 October 1965, the same date as the closure of the Highland line between Aviemore and Forres. Grantown on Spey, which had previously been served by two separate stations, was now left without any rail connection. Goods traffic lingered on for a further three years, mostly the whisky trains, until this too ceased on 4 November 1968. The track was lifted the following year. 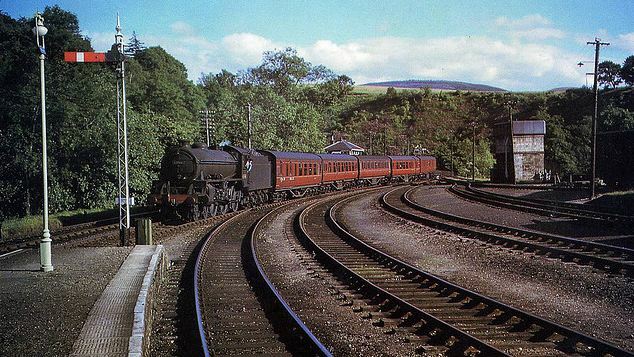 The short section between Aberlour and Dufftown remained open for goods traffic until the end of 1971. Although the two stations at either end of the line are open, serving two heritage railways, (the Keith and Dufftown Railway at Dufftown and the (second) Strathspey Railway at Boat of Garten on the Highland Railway’s Aviemore to Forres route), no part of the original Strathspey Railway has been preserved. However, the section between Ballindalloch and Craigellachie has now been converted into part of the Speyside Way, which runs between Ballindalloch and Spey Bay.